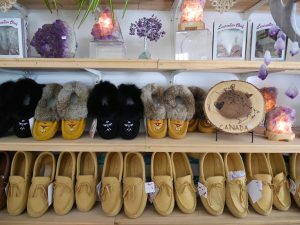 Liisa Karkkainen’s famous shop lies just off the Trans-Canada Highway 11/17 on picturesque Lakeshore Drive, about 20minutes’ drive east of Thunder Bay, Ontario. 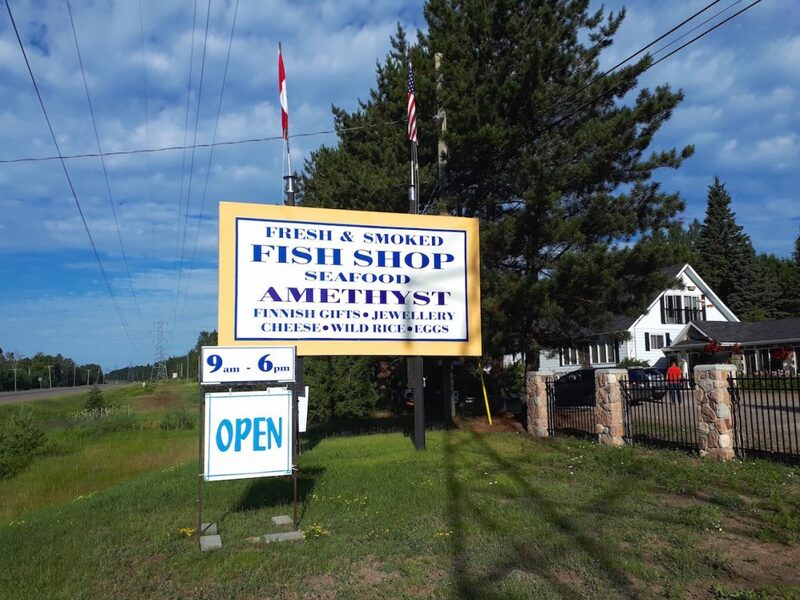 Opened in 1970 and known by generations of locals and area visitors as the best place to buy fresh and Finnish-style smoked local fish; specializing in Lake Superior and Lake Nipigon Canada Grade A Fish, including White Fish, Red Fin Trout, Northern Pike and Lake Herring. The Fish Shop has expanded over the years to encompass more of Liisa’s Finn heritage and now houses a separate showroom featuring Finnish foods, crafts and gifts as well as one of the most remarkable selections of amethyst specimens and art in the area. Hilkka Hautala began smoking her own fish in traditional Finn fashion soon after her arrival on the North Shore of Lake Superior and as word of her delicious handiwork spread she found herself with business at her doorstep. A practical woman, she decided to welcome it in and in 1970 began purchasing from local fishermen and operating the smoker full-time, expanding her operation to include a selection of local fresh fish as well, servicing area residents’ demand for a regular supply. Liisa, Hilkka’s daughter, began operating The Fish Shop in 2004 with Hilkka’s blessing and has carried on the family tradition of natural Finnish smoking methods while expanding The Fish Shop’s menu to include imported seafoods, local farm-fresh eggs, wild rice, birch and maple syrup, local preserves and even fresh produce during the warmer months. For four decades demand for fresh and smoked Fish Shop products has steadily increased as word of the quality and variety of The Fish Shop’s offerings travels home with area visitors, crossing provincial and natural borders. A unique selection of the finest fish at the fairest price. All the available local fish is caught by licenced commercial fishermen and treated with utmost care for quality and safety. Sweet-fleshed Great Lakes fish is among the best in the world. The natural, delicate, aromatic smoke of green alder wood burning steadily in the smoke-house. A perfect match. 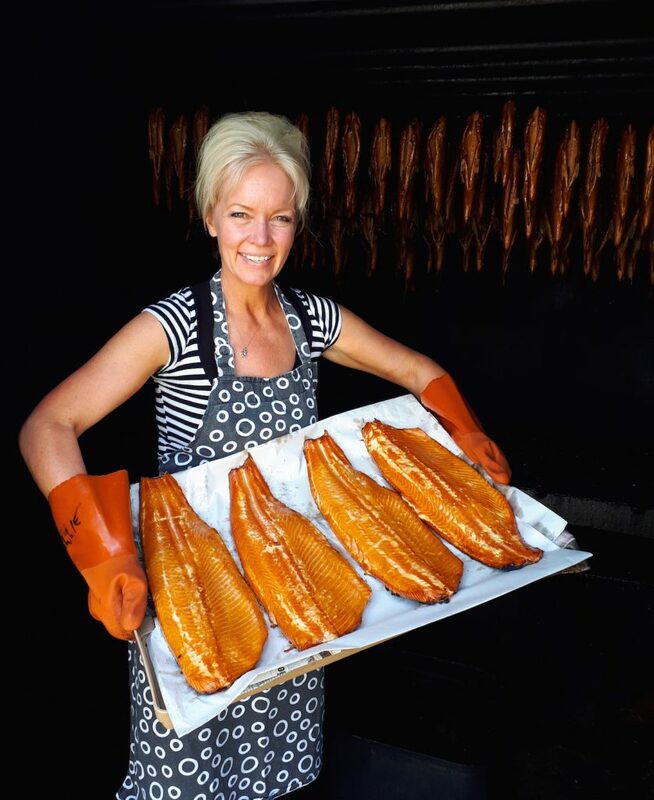 As traditional Finnish smoking methods, we use no chemicals, nitrates or liquid smoke so we can make sure that smoked-fish lovers have a wonderful, healthy taste experience. Soaring ceilings and perfect lighting characterize the airy space of the Gift Shop. It’s the perfect backdrop for an exquisite collection of local temptations chosen with style, humour and an eye for the unusual. 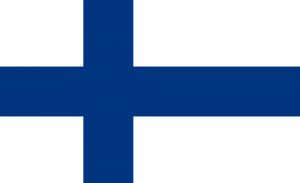 In the Gift Shop you’ll find Finnish crafts like Lapland hats in a hundred different colours. A selection of local semi-precious stones fills one case. Another displays an amazing collection of amethyst specimens from local mines. Whether you’re looking for a gift for someone special, a keepsake from your visit to the North Shore or an attractive addition to your lifestyle, you’ll find plenty to tempt you in the Gift Shop. Visit the links above to learn more about this remarkable, amethyst Northern phenomenon. 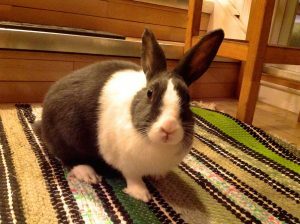 A white-and-grey rabbit was dumped off in April 2016 in the parking lot in front of the shop. The rabbit lived for a while in the amethyst rock display and rose bushes out front of the store. She kept digging tunnels, and so we jokingly started calling her ”El Chapo”. We kept an eye on her, at first thinking she was a wild rabbit. But when an employee said she had been petting the rabbit, we realized she was domesticated and we decided to try and catch her using a smelt net. When we went to get her, she hopped right in to Liisa’s arms. A little online research later, we learned El Chapo was a Dutch rabbit and that a rabbit that looked a lot like her was a grand champion at the Minnesota State Fair. On a whim, we decided to enter her at the 150th Hymer’s Fall Fair. El Chapo immediately caught the judge’s eye and began racking up first-place ribbons. She is a champion, our champion. El Chapo lives with us in the shop. Come to say Hi!